Lookit all deez puppets, man! Dey be fightiní and scrapiní over all deez here shrines Skree built. I is gonna spy on dem and see how dey be goin' after each other in da battle station. Dis gonna be fun, ja, ha, ha! Yes, yes, Skree's own wicked commentary gonna add to da fun, live from da control chamber! My people, dis gonna be a great day for da gods! 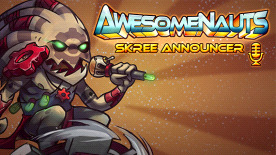 The Skree Announcer can be activated from the character select menu or the in-game menu. Activating this Announcer will replace the default announcements made during regular gameplay with a whole new set.